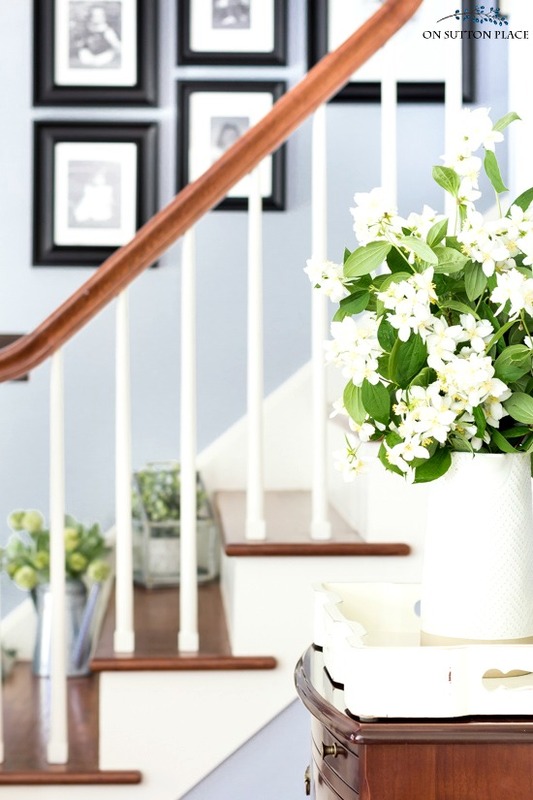 Small foyer ideas that include fresh summer decor and seasonal accessories. 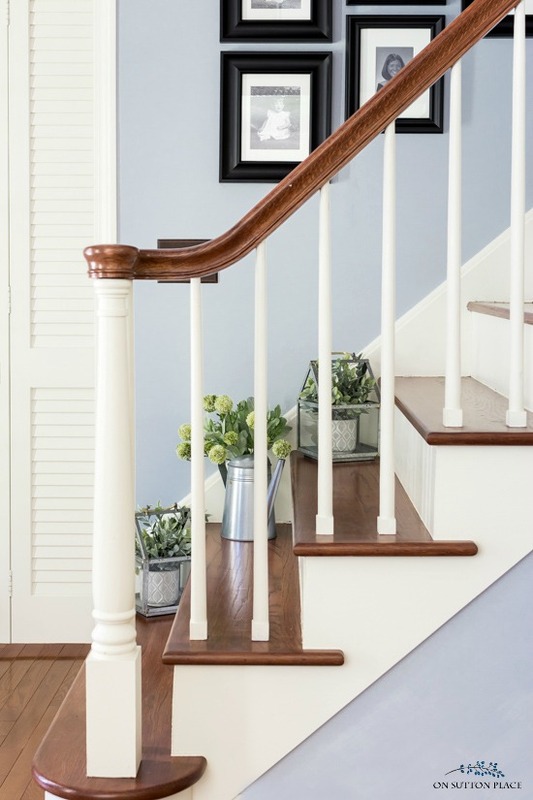 Easy and budget-friendly inspiration to update a foyer in a few hours! We all have rooms in our homes that tend to fall to the bottom of the “refresh” list. I actually have a few rooms that could use some sort of update and our foyer was at the top of that list. It has been unchanged for several years. I’ve added seasonal decor but nothing that really changed the look of the space. Truth be told, this little makeover didn’t include very many changes, but even the small ones I accomplished made a big difference. Before we get to the foyer tour, I’d like to welcome anyone coming over from Lucy’s blog, Craftberry Bush. The Seasonal Simplicity Home Tour series is back and there will be more about that at the end of the post. The rug in our foyer was showing wear and tear, so that’s where I started. I chose a bright Dash & Albert rug in a rugby stripe pattern. It’s an indoor-outdoor rug so it should be easy to keep clean. Simply adding color and pattern in front of the door made a huge difference. I hadn’t changed the wall decor over the chair for years. In fact, it’s the first thing I see as I’m coming down the stairs so it’s a spot I should change quite often. I picked up the set of Rae Dunn plates at T. J. Maxx and they are perfect for the narrow piece of wall space. The chair stayed the same but I added a striped pillow from my stash. The blues all work together and give the corner a fun and fresh look. I occasionally add accessories to the first few steps in our foyer and that gives me another place to work in some greenery. The galvanized lanterns, along with a small watering can, give the wood stairs some life. The staircase is wide enough that the items don’t get in the way at all. We’ve made it around our little foyer to the main wall. (We didn’t have far to go!) Again, there isn’t much room, so I have to take advantage of every square inch. 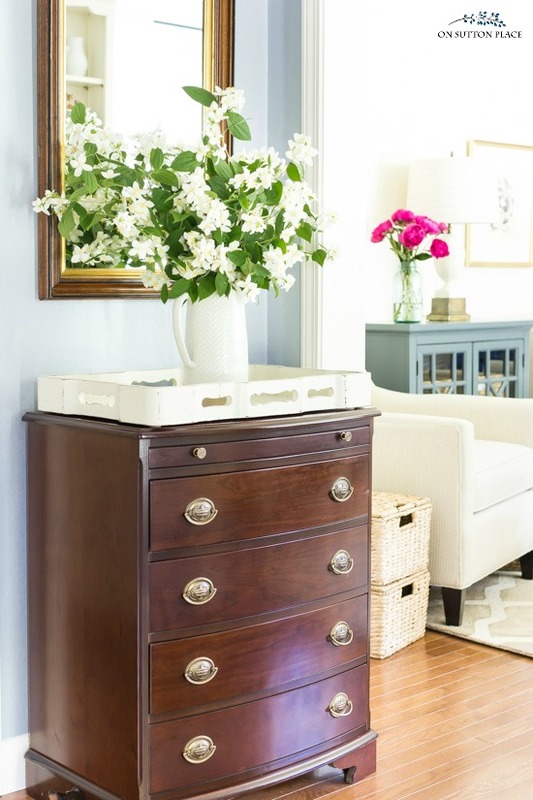 The small chest of drawers and mirror add much-needed storage and function. They are, however, dark and they have been around for a very long time. Trying to make this area look new and improved is a real challenge. I’ve got the top of the dresser to work with and that’s it. To lighten things up, I placed an ivory wood tray on top of the dresser. Fresh flowers lift the look of any space so I filled a pitcher with blooms from my neighbor’s yard. They are from her sweet mock orange bush that I wish was mine! T.J. Maxx: Plate set on wall, striped pillow, faux greenery. Vintage or Inherited: Mirror, small chest of drawers, chair, wood tray. Wall Paint Color: Upward from Sherwin Williams. Small spaces can be easily updated with a few new accessories, some flowers, and a shopping trip through your home. Something as simple as a new rug can be a breath of fresh air in a stale room. Starting from scratch just isn’t practical for most of us, so I hope you found some inspiration if you have one of those “refresh” lists! Speaking of inspiration, this edition of the Seasonal Simplicity series is all about simple summer decor touches! All week long, my talented blogging friends and I are sharing part of our homes. Now it’s time to send you on to my lovely friend Lory and her blog Designthusiasm. She’s sharing her bedroom and it’s loaded with summery loveliness. I can’t wait to take in all the gorgeous inspiration…please take a minute and visit some of the links that catch your eye! « Home Style Saturdays: Cafe Curtains, A Naked Cake, Countertops & More! 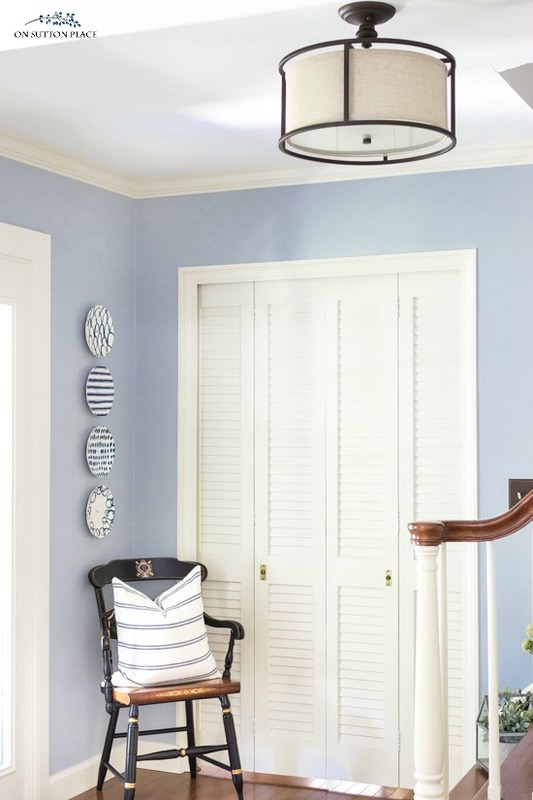 I love, love, love the blue and white plates on the wall and your striped rug. You’re ready for summer! Your home is so beautiful, Ann. I love all the blue with wood tones. Ann it all looks so fresh and pretty – love that your small changes made such a big impact! And the rug is absolutely darling! HI Diane! The color is Upward from Sherwin Williams. Thank you! Love the changes! Amazing how just a few little changes can really give a tired space new life. Ann, I love your style. Your foyer looks so crisp and fresh for summer. Where did you purchase the faux greenery on the stairwell in the watery can? What type of foliage is it? Hi Lorraine! I got the round green flowers at Magnolia in Waco. The greenery is lambs ear and I ordered it from Amazon. I added the link to the post. Thank you! Nice, easy touches Ann. Thanks for the inspiration. Always love your style! 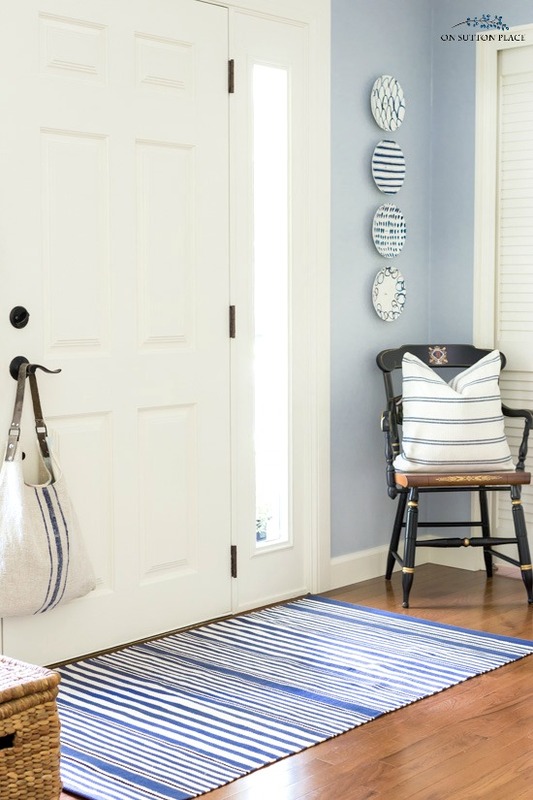 Do you have a source for the cute bag hanging off the door knob in the 2nd photo? Hi Carrie! The bag was a gift from my daughter several years ago. There is a seller on Etsy who makes grain sack bags and they look amazing. I added the link to the post. Thank you! Mock orange blossoms are so pretty! Your foyer looks fantastic, Ann! So glad you could be part of the tour! Ann everything you did looks lovely. I love the blue wall color. We painted our bedroom a similar color and I love the calmness and softness . I always enjoy seeing your new decor creations. I think you do a fabulous job. Hugs!! It is so pretty and classic, I love it. I would steal that chair if I could! Blue and black is a favorite color combo of mine and I like the photos done in black and white. May try that with ours. I also love that little chest of drawers, such a stunner. Love it when “little” touches change so much!!! It looks lovely! Perfect for summer – and all year. I’m always amazed by how a new rug and accessories can make such a huge difference. 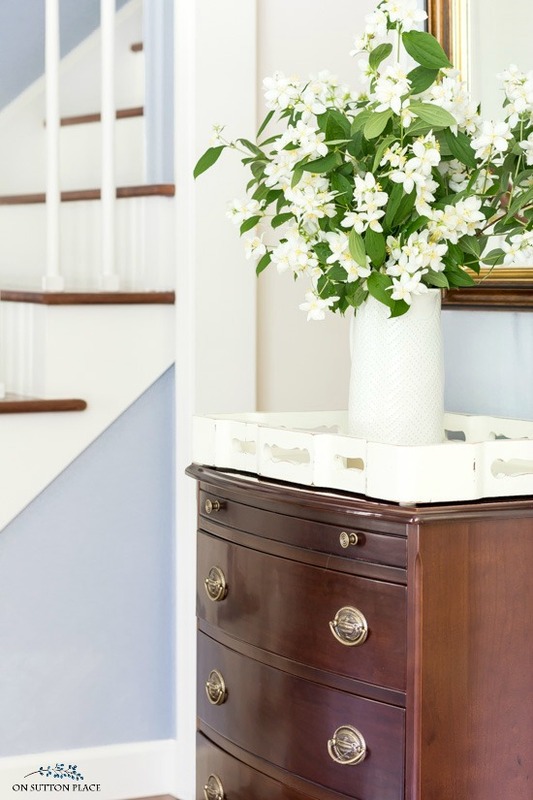 Ann, you have done a lovely job with your “summer refresh” in your foyer! The staircase with the added greenery is so cute! Your home is just so beautiful! Enjoy! Blessings! Your foyer is always one of my favorites, Ann. I love the classic summer look you’ve created and I also love the new rug! I recently got so sick of the rug in our foyer that I literally tossed it outside. It was slowly unraveling and I haven’t found one to replace it yet. I’ll have to check out Dash & Albert. Thanks so much – you lift my spirits! Today is one of those days. I have always loved your foyer. It never seems unwelcoming to me. What’s you have done shows so well how small tweaks can have a big impact. Still love the blues! And the tray…I am coveting a little, well, actually a lot. I love your practical yet elegant approach. Thank you for sharing. Just so lovely! The blue paint is so crisp and fresh looking. 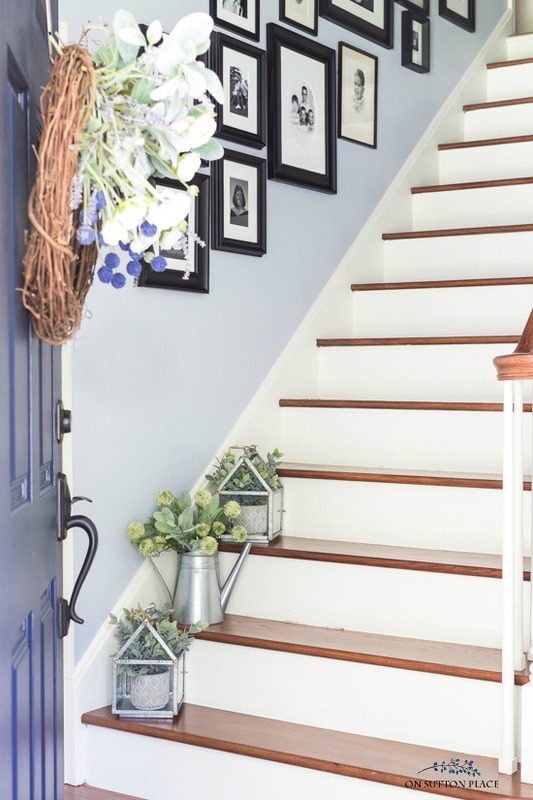 Never thought to paint a foyer that color. What color/paint did you use? Hi Mary-Ellen! The paint color is Upward from Sherwin Williams. I need to add that to the post! I love that look and especially the little chest. Fits perfectly there. Ann, I like that your chest matches your stair treads and banister. Lovely! Looks lovely, light and airy. Ann, I always like looking at what you have done in your home. Your foyer is so nice and in place. Love what you have done! Ann, your foyer refresh is lovely!! The touched of blue are perfect for summer and the rug is really great! Also love love love the greenery on the steps! I love your wood furniture. Your piece in the foyer is beautiful. It adds some contrast and frankly, I don’t like all white furniture. Same goes for your dining room. Love your set. Accessories and details are what gives rooms their special touches. And you sure have the knack-love your house. I go through it often in your archives. Fresh and pretty as always! I hadn’t really thought about how badly I need to replace throw rugs. I will now be looking for fresh ones for our house too. Thanks.